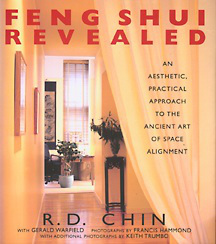 Feng Shui beginners searching for wisdom will appreciate the knowledge of R.D. 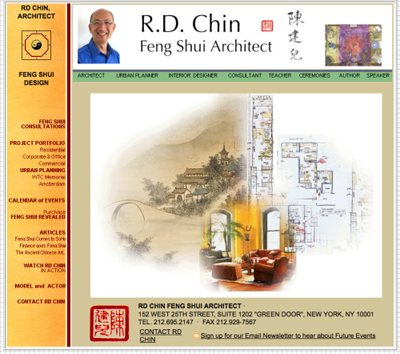 Chin, Feng Shui Architect in New York who has written a very special book called "Feng Shui Revealed"
I was lucky enough to speak with him; he is a very gentle and special man, like every master should be. He has agreed to share with us some of his wisdom and if you are in New York he is available to consult for your Feng Shui decorating as well as offering a very special program to teach practical methods and the application of feng shui principles to the design of spaces and how it affects the inhabitants. Master Chin says: "To create an uplifting sense of lightness, try painting living room walls a rich, vibrant yellow, amplified by the sunlight coming through your windows. Polished wood floors further reflect the warmth and the light of the room. Energy positively surges through the space, but it can be calmed by the stability of the rug, which marks a comfortable sitting area. The added touch of the palm tree completes the picture, creating an oasis - a place of rest. The essence of feng shui is a harmonious relationship between you, the spaces within which you live, and the environment. This harmony and balance can be achieved by the application of a few fundamental principles, a healthy dose of common sense, and a willingness to listen to one of your own most trusted advisers: YOURSELF." "Traditional Feng Shui studies for today’s Global world!" Following the traditional Chinese practice where the student comes together directly with the teacher, this intimate approach will be an organic process and a positive support in your life’s journey. The essence of my teachings is an in-depth study of "Chi" energy and how to apply this knowledge to help others. With my professional background and education as an architect and interior designer, my approach is to teach practical methods and the application of feng shui principles to the design of spaces and how it affects the inhabitants. I want to acknowledge that my teachings originated from the late Grandmaster Lin Yun, my experience with the late master architect Paul Rudolph and my studies with many teachers in other feng shui traditions. In keeping with the Tao, diversified classroom settings will enhance our studies together where we will have an opportunity to experience the chi energy of different spaces. We will study in the conference room of my office, a traditional Chinese tai chi studio, a client’s office, a residence, a Chinese restaurant, a Buddhist temple, St John the Divine Cathedral, the WTC Memorial, or even a quiet location along the Hudson River connecting to the Sun and the Moon….wherever the chi energy may take us. This program is complementary, practical and an excellent supplement to your feng shui studies and your current professional occupation. The owners of this Westhampton Beach home enlisted a feng shui architect to help them design a modern beach house with ch'i energy and balance. Eli Katz, who works as an independent stock trader, purchased the property in 2001 for $1.5 million. In 2007, Mr. Katz and his wife, Janis Altman, decided to tear down the old house and rebuild on the property. Eli Katz is the owner of this Westhampton Beach home. Mr. Katz, who works as an independent stock trader, purchased the property in 2001 for $1.5 million. During the planning stages, the couple brought in feng shui architect R.D. Chin, who helped to determine the bed placement within the new home's four bedrooms. He also assisted with choosing the materials, colors and flooring for the home. "Their house is basically a white house," said Mr. Chin. who suggested the couple use orange and yellow accents to balance the home. "If it was too white, it creates disharmony." Mr. Katz made other changes based on Mr. Chin's recommendations. "We wanted a light shade of wood floors and he said you need dark wood floors to ground the house," Mr. Katz said. The couple spent more than $2 million on the three-story home, which was completed in 2009. It covers some 4,054 square feet and has 4 ½ bathrooms. At the front entrance of the house, which overlooks the ocean, is a waterfall meant to bring prosperity. There's also a heated pool, elevator and fireplace, a contrast of the water element. Inside, light from the floor-to- ceiling windows pours into the angular home. Town & Country Real Estate agent Joan Duval, one of the brokers with the listing, says that while the use of feng shui isn't an overwhelming trend, she thinks it's slowly catching on with home owners. The home has an open listing and is priced at $5.3 million. It has been reduced by 14.5% since it was first listed in December 2009 for $6.2 million. Here is a case study where an apartment located in the Upper East Side of New York City was going to be completely renovated. As the consulting feng shui architect and interior designer, this was the perfect opportunity to help with the initial design process and to create a Masterplan with intention. In this situation, the owner wanted to meet the girl of his dreams as well as to make an investment on this apartment. I am happy to report that both of his initial intentions were fulfilled. Also, take the time to view the video where this apartment was featured in a home makeover show "Gimme Shelter" as well as a TV newscast illustrating the completed apartment. 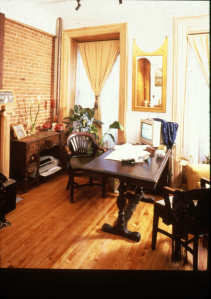 Arched doorways which represented "soft female" energies were built to balance the masculine energy of the owner as well as the "yang" location of this apartment unit relative to the entire building. his table (desk) acting as the home office was located in the "commanding position" as well as creating a "homey" inspirational place to do one's work and enhancing one's "Career"
To help people harmonize and balance their lives through their spaces…and to empower themselves and their own creativity. To teach people about universal principles and honoring ancient traditions and nature. a valid and practical approach to plan for all types and scale of projects: homes, offices, commercial, corporate, developers, and for urban, environmental and global planning. We need to be very selective: To work on projects that really stimulate us! To be with people who really energize each other through their integrity, responsibility, creativity, and spirituality…the enjoyment of a team effort and collaboration! To observe, conserve and be truly concious of our own energies. To promote prosperity, health and happiness for all!